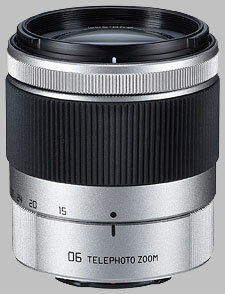 (From Pentax lens literature) Introduced along with the Q10 is the new super-compact and lightweight Q-Mount Pentax 06 Telephoto Zoom lens. This high performance, interchangeable zoom lens features an F2.8 maximum aperture throughout its entire 15-45mm zoom range and is designed for exclusive use with the Pentax Q-Mount line of digital cameras. When mounted on a Pentax Q-mount digital camera body, it covers focal lengths from 83mm medium telephoto to 249mm telephoto (equivalent 35mm format) ideal for portraits, sports events and landscape photography. The Pentax 06 TELEPHOTO ZOOM lens covers focal lengths between 15mm-45mm (equivalent to 83mm-249mm in 35mm format), and features a maximum aperture of f/2.8 throughout its entire zoom range. Incorporates two ED (Extra-low Dispersion) glass elements and one super-low dispersion glass element for exceptional image rendition. Measures 2.2 inches in length and 2.0 inches in diameter, and weighs in at 3.2 ounces; making it extremely compact and lightweight by design. Quick-Shift focus system allows for instant switching to manual focus. Super Protect (SP) coating is applied to front surface of optics. The Pentax Q 15-45mm f/2.8 06 Telephoto Zoom doesn't have any user reviews yet!